Here at the training end of Wild Turkey Farm, we offer the highest quality care and work environment for current and future competition horses. With our qualified, experienced staff of Trainers, Riders and Grooms, our horses receive tailored programs suited to their experience levels and age. Our top of the line facility, including spacious stalls with stall paddocks, 60’ x 60’ sand and grass turnout paddocks, an indoor and outdoor arena with top of the line, manicured footing, makes it a happy life here for horses in training. To further assist our horses’ conditioning, we are able to offer time on an indoor walker, sheltered from the weather, as well as a treadmill, which enables us to work horses on inclines, helping strengthen hind ends. As horses progress, and with the advice of our Veterinary and Farrier teams, we have several therapy options available to relieve any tension including: Thera-Plate, Centurion icing system, Centurion Magnetic Blankets, Equi-Pulse and a UV heat lamp. Rounding out our training program is our quality feed, including Timothy, Orchard Grass, and Alfalfa hay, as well as specially ordered grains and supplements. Wild Turkey offers a wide variety of available sales horses from just started under saddle, to going competition horses. Our staff of Trainers and Riders specializes in bringing along well-rounded, levelheaded and talented youngsters suitable for any discipline. 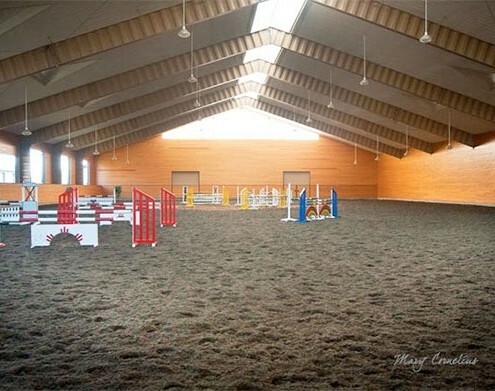 With our large arenas, show quality jumps and our ability to match horses and riders, we hope to give you a successful shopping experience. Wild Turkey Farm welcomes outside horses to our facility for training, sales and rehabilitation. Our riders and programs offer your horse the best in training, from just starting under saddle, to horses ready to show and compete. Our calendar of quality horse shows gives your horse the opportunity to gain miles and success in the ring under experienced riders and trainers. If you are marketing your horse for sale, our long list of contacts and customers allows us a large audience to advertise your horse to. Horses that require the best in care when rehabilitating from injury are offered excellent Veterinary care, therapy machines and ideal footing to work in. Wild Turkey is able to cater to your horse and tailor training, feed and care programs to best fit his needs.